Popularly called as “Manbhum-Janani” (mother of Manbhum) by the people of Purulia, Labanya Prabha Ghosh was married to Atul Chandra Ghosh at the tender age of 11. She was the pivot of “Shilpashram” (Rural Industry Development inside the Ashram living mode) at Telkalpara, Purulia town. “Shilpashram” was the epicenter of the freedom struggle of Manbhum region. In 1926, she became the elected representative of District Congress Committee from the then Manbhum district. In 1930, she played a major role in “Salt Agitation” (“Laban Satyagraga”) by Mahatma Gandhi and in 1945 at “Pataka Satyagraha” at Konapara. British government sent her to jail several times. 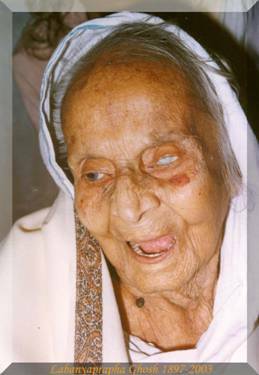 After Independence, she was in forefront of “Bhasa Andolon” (Language agitation) at the then Manbhum district against the forcible imposition of Hindi language over Bengali . Bihar government sent her to jail several times and imposed a fine of rupees six hundred. As a result of the “Bhasa Andolon” (Language agitation), a new district Purulia was curved out of Manbhum district of and acceded to West Bengal from Bihar. During the emergency period in 1975, she was jailed. She wrote a number of articles at the “MUKTI” periodical – first of its kind at Purulia district. She was elected as a MLA from Purulia Assembly Constituency.